Have you performed in any of these works or come to watch? Please share below! 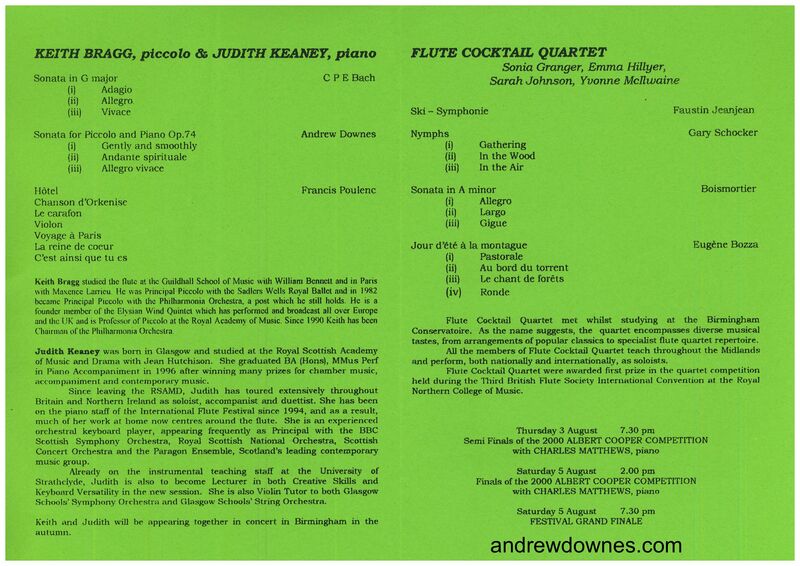 In order to show his appreciation to flutist, Carol Kniebusch Noe, for all the wonderful performances of his flute choir works which she directed, Andrew offered to write a Flute Sonata for her. 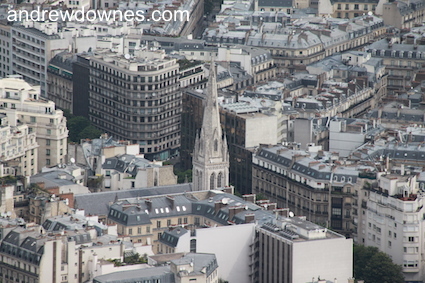 Carol readily accepted and decided to organise the world premiere in the American Cathedral in Paris! Andrew and I were delighted! 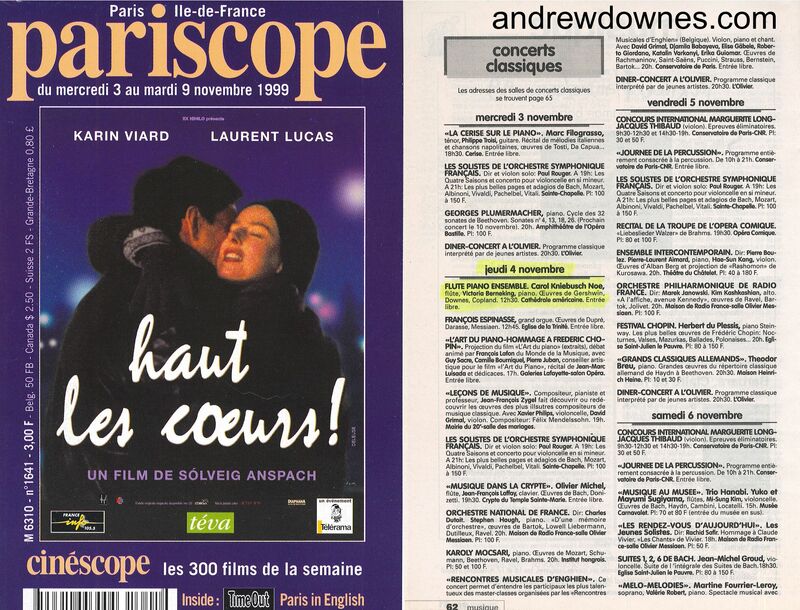 When we arrived in Paris, we were very excited to see the concert advertised in the "What's On" guides! Carol and accompanist Vicki Berneking gave a stunning first performance of the Sonata to a large and appreciative audience. This Cathedral has a beautifully ornate grand piano, which looked and sounded gorgeous. After the concert we all went out to a Parisian restaurant and then on a late night ride on a 'bateau mouche' down the Seine. It was freezing on that November night! The following March we went to hear Carol and Vicki perform the Sonata again, in the Wilson Hall of James Madison University of Virginia, USA, where both artists were Professors of Music. 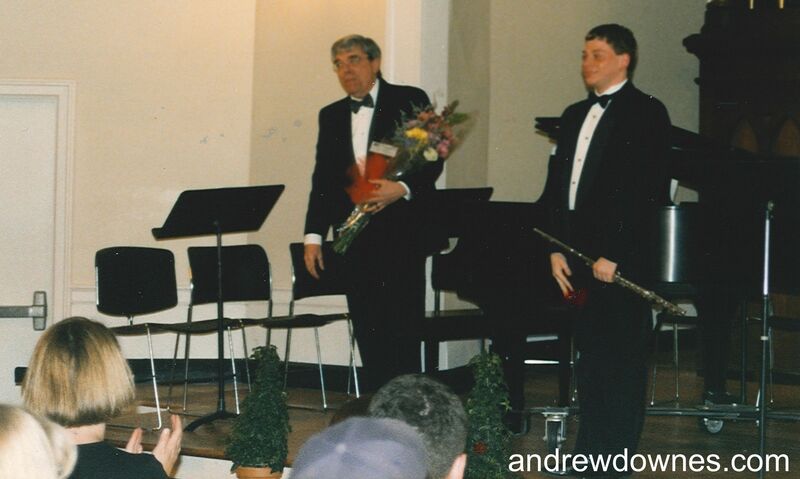 This was a very special concert for us, because it was entirely devoted to Andrew's flute music. 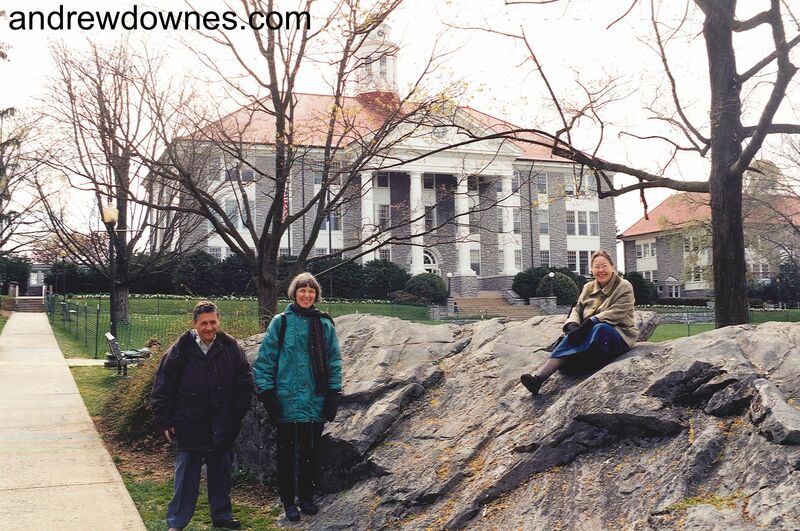 After the Sonata for Flute & Piano, Carol directed the James Madison University Flute Choir of Virginia in Andrew's Fantasia for Alto & Bass Flute soloists with Concert Flute Choir and finally the world premiere of Andrew's Song of the Eagle for Flute Choir, which Carol had commissioned for the 25th anniversary of her Choir. 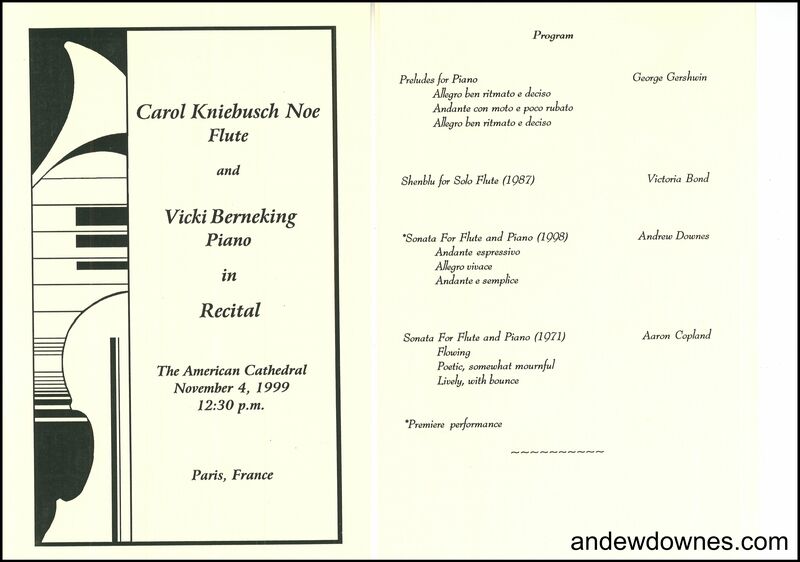 This was a very big evening for Carol: she played and conducted in the same concert; and she conducted Andrew's Song of the Eagle in a concert the following evening as well! This was all part of a "Pan-o-rama" flute weekend, organised by Carol, where Andrew was also asked to participate in a question and answer session on his career and careers for musicians. Virginia in the early springtime was beautiful. The people there were extremely friendly, particularly Carol's flute students, who were thrilled to meet Andrew. 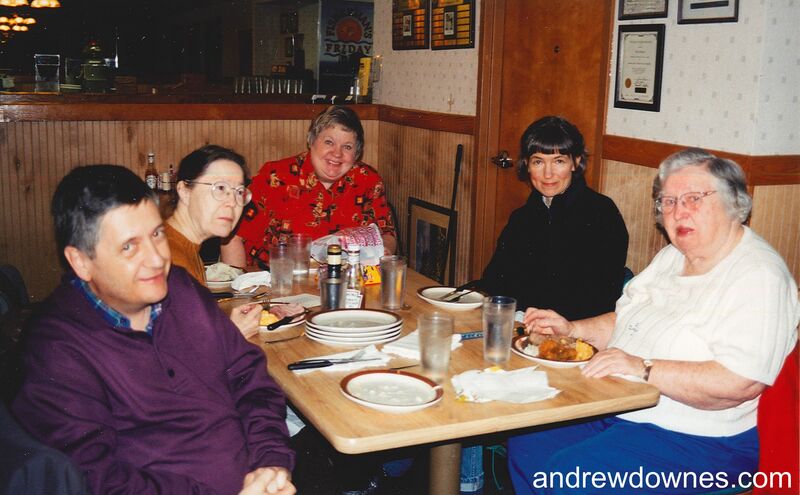 Margaret Lowe, who commissioned most of the Andrew's flute choir works, and her husband, Jim, came with us on the trip. 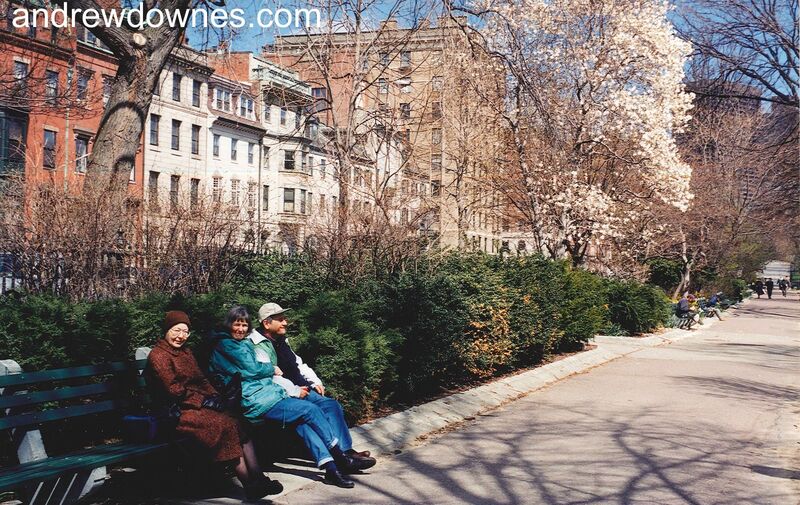 After the concerts in Virginia, Jim drove us up to Boston, where we had another treat in store. 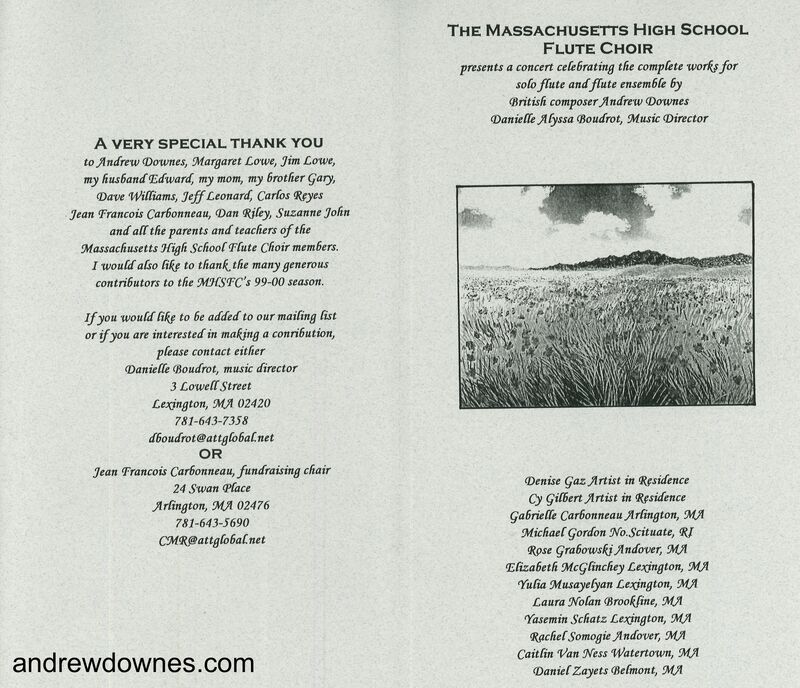 The outstanding Massachusetts High School Flute Choir, trained to perfection by Danielle Boudrot, also put on a concert of Andrew's Flute Choir music, in Arlington, Boston. 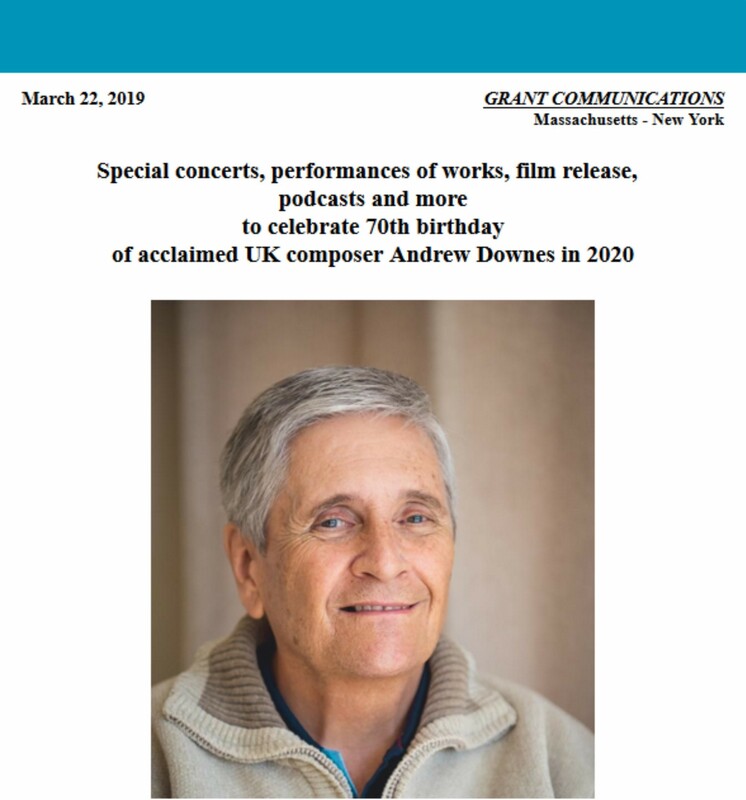 Michael Gordon, a member of the flute choir also gave a super performance of Andrew's Sonata for Flute and Piano, with accompanist, Thomas Stumpf. 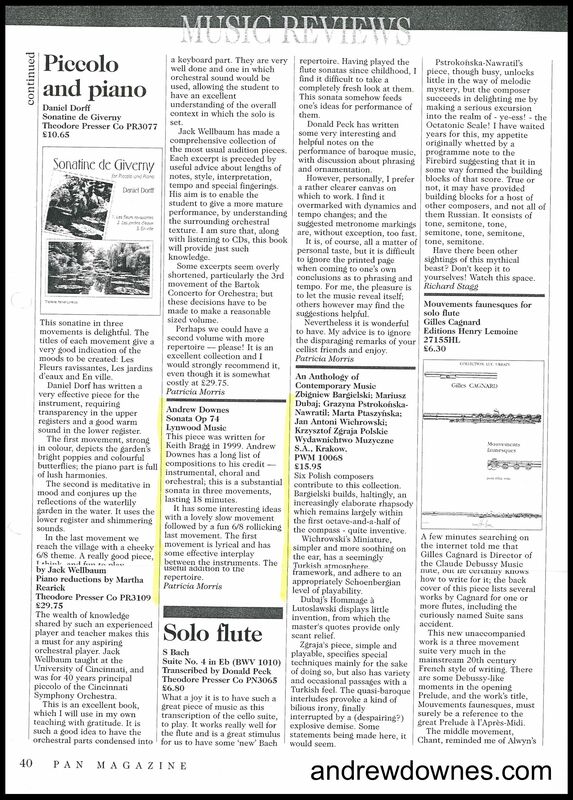 Back in England, Music critic, Dr David Wright, suggested we send the Sonata to a friend who lived near him on the Isle of Wight. 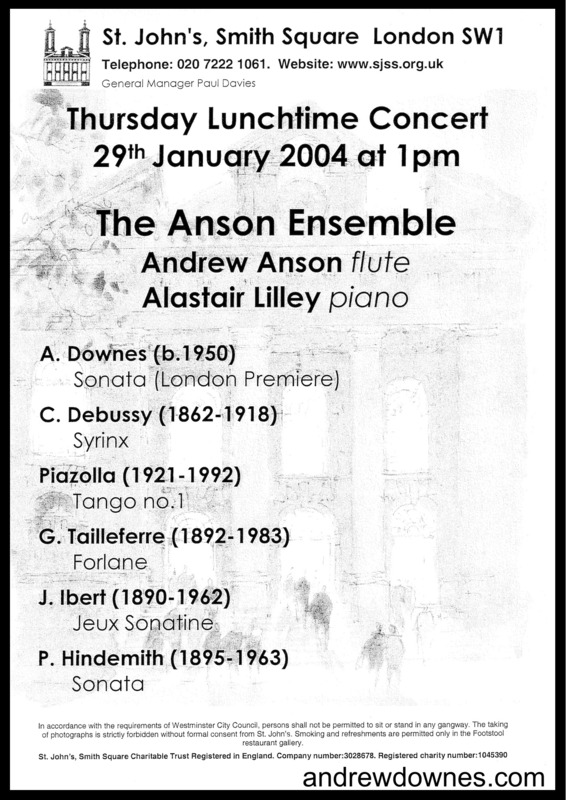 The friend was Andrew Anson, a superb flutist. 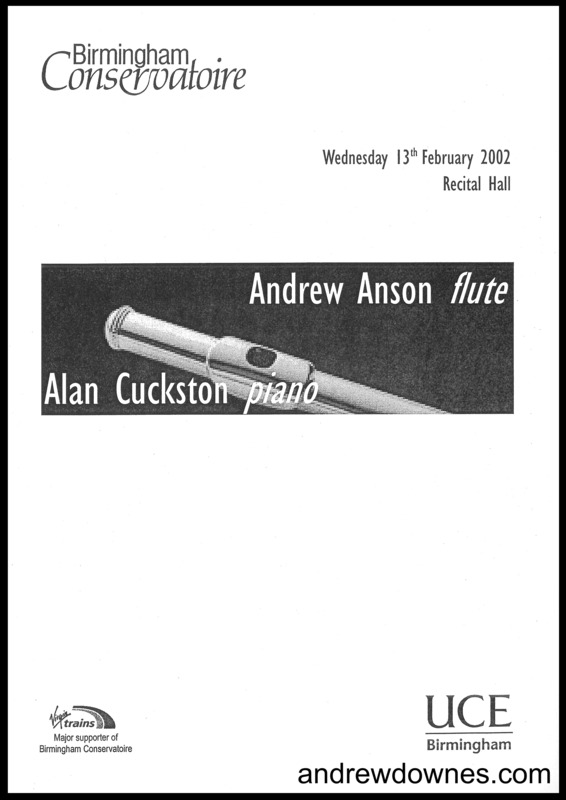 Andrew Anson gave the UK premiere of the Flute Sonata with accompanist, Alan Cuckston, on February 13th 2002 at Birmingham Conservatoire. 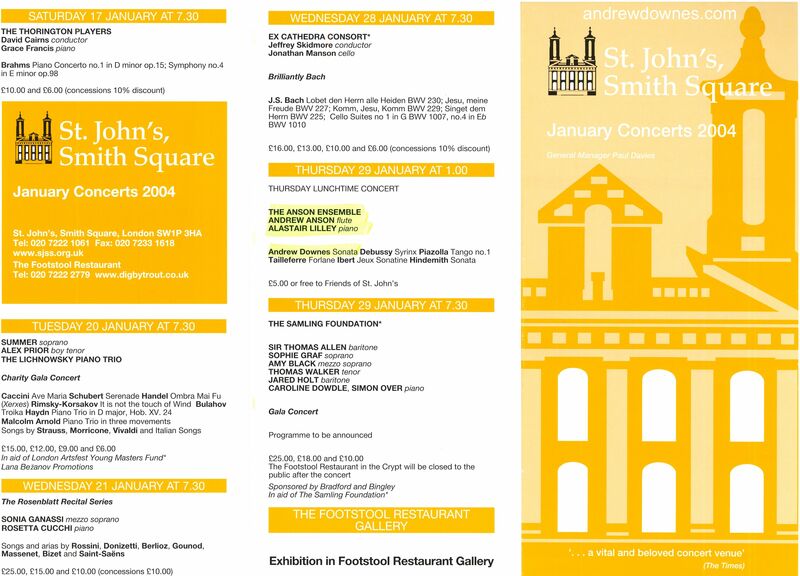 Then, in January 2004, with pianist Alistair Lilley, he performed the work in a recital in St John's Smith Square, London. 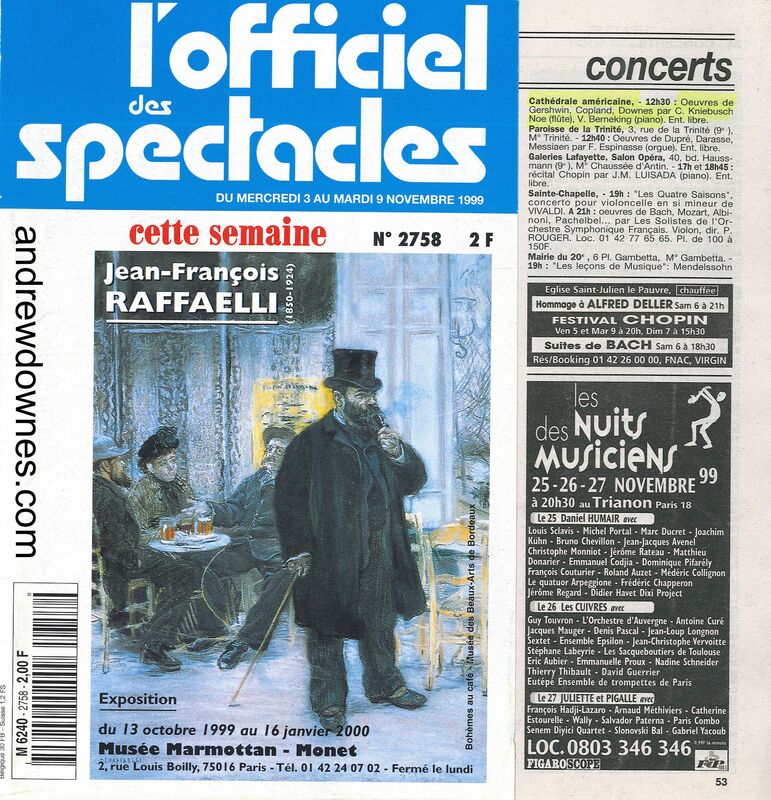 Andrew and I were almost prevented from going to this concert by freak weather the day before. It had rained heavily all day (washing away the salt which had been put down) and then there was a sudden huge drop in temperature just as everyone in Birmingham, including Andrew, was leaving work for home. The roads became like ice rinks. There was traffic chaos. I was very worried about Andrew. I phoned him in his car (not against the law then) and said I would book him into one of the first hotels along the Hagley Road. It took him 4 hours to get to it! Others didn't get home to Hagley till the early hours. Then overnight there was a thaw, just as sudden. I phoned Andrew in his hotel and suggested we meet at Snow Hill station. I took the train there and we travelled on to London, not being able to believe our luck. The recital was excellent. We were very glad not to have missed it. 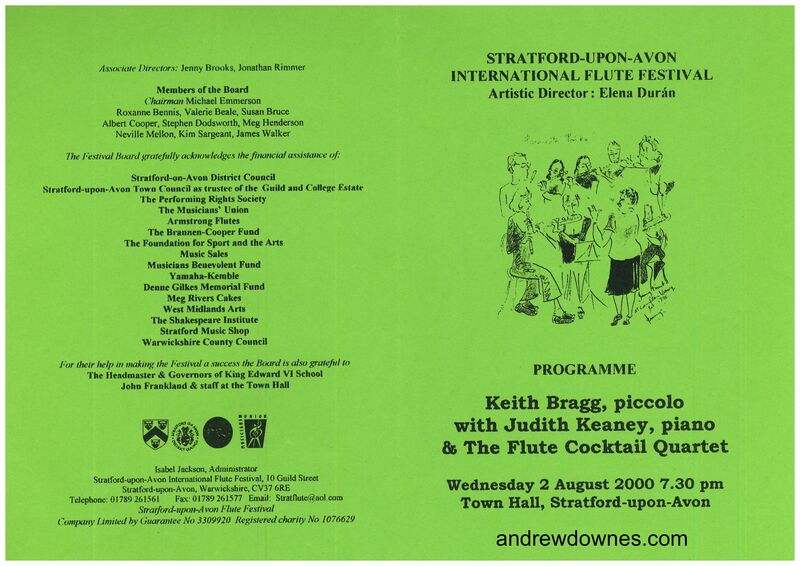 At the 1999 Stratford International Flute Festival, when Jenny Brooks directed 2 superb performances of Andrew's Sonata for 8 Flutes, she introduced Andrew to Keith Bragg, Piccolo player and Chairman of the Philharmonia Orchestra. Andrew offered to write him a Sonata for Piccolo and Piano. 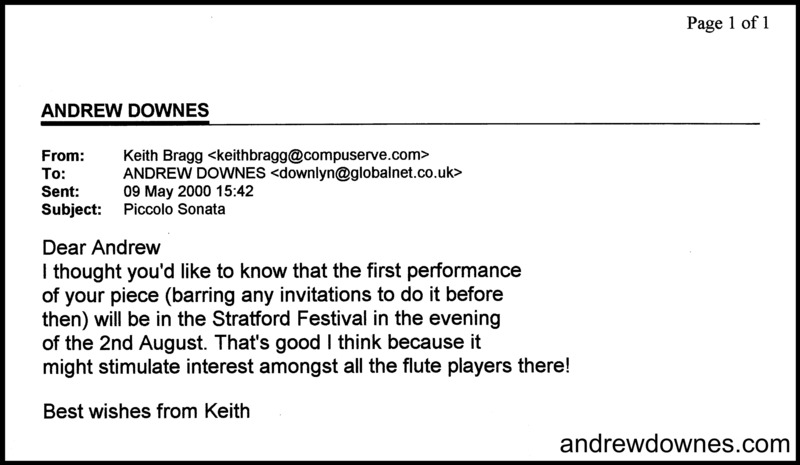 Keith thought it a good opportunity to do a piccolo recital at the next Stratford Flute Festival. 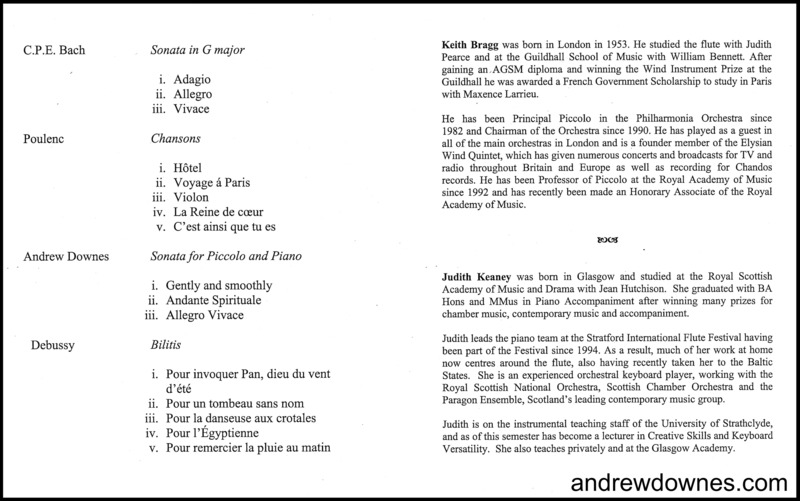 With his accompanist, Judith Keaney, he gave a fabulous first performance of the Andrew's Piccolo Sonata in Stratford Town Hall on August 2nd 2000. 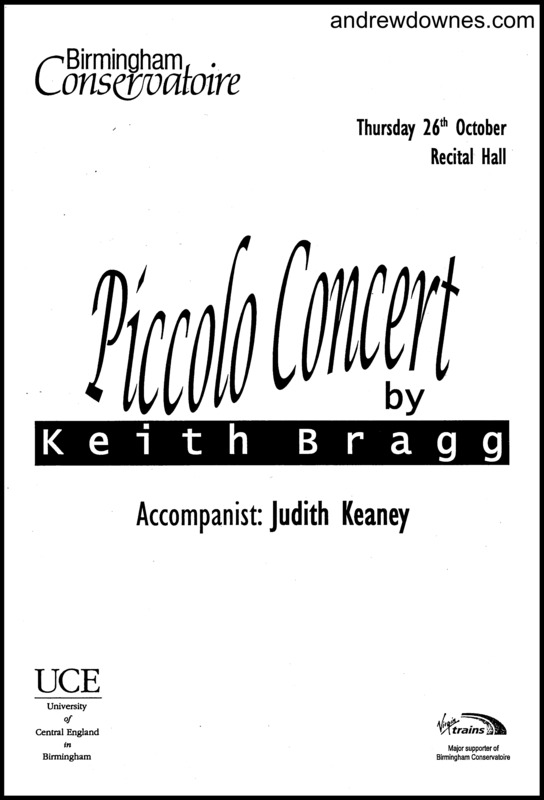 In October of the same year Keith and Judith performed the work again at Birmingham Conservatoire. I was lucky enough to be at both performances. 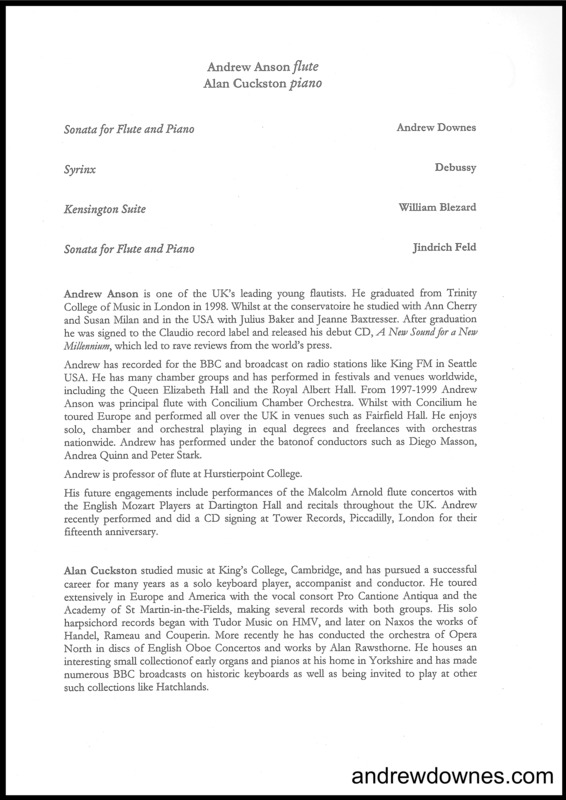 In the Andrew Downes Performance Prize competition in 2014, Arjun Jethwa, accompanied by Charles Matthew, gave a memorable performance of the Piccolo Sonata. 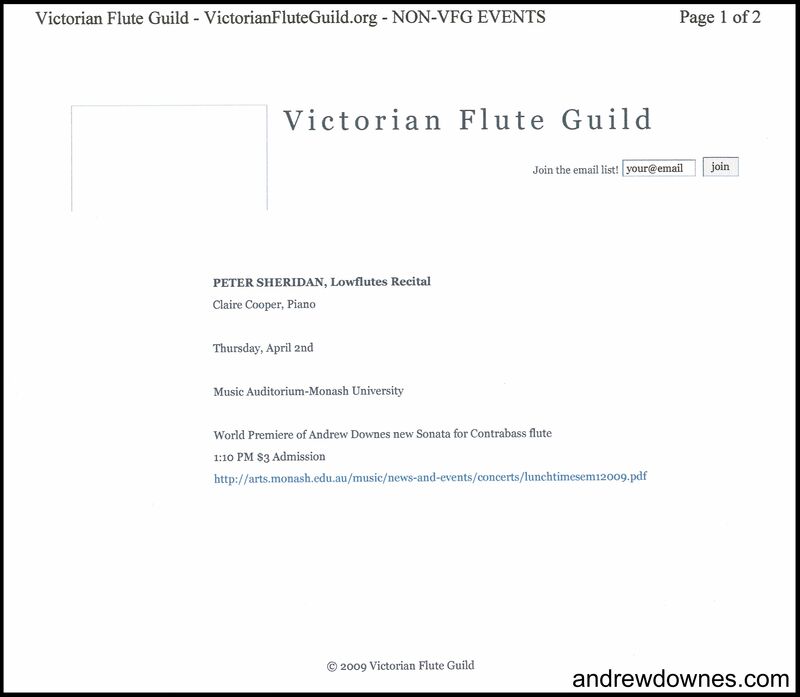 When the phenomenal champion of low flutes, Peter Sheridan, asked Andrew to write a piece for Contrabass Flute, Andrew took on the task of composing a whole Sonata for the instrument with his usual creative energy. 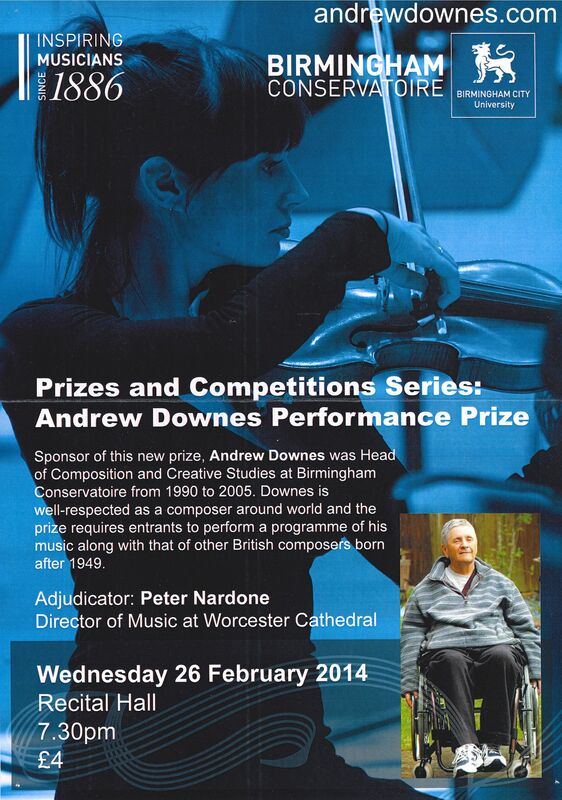 He composed a stunning work, which Peter plays amazingly beautifully. 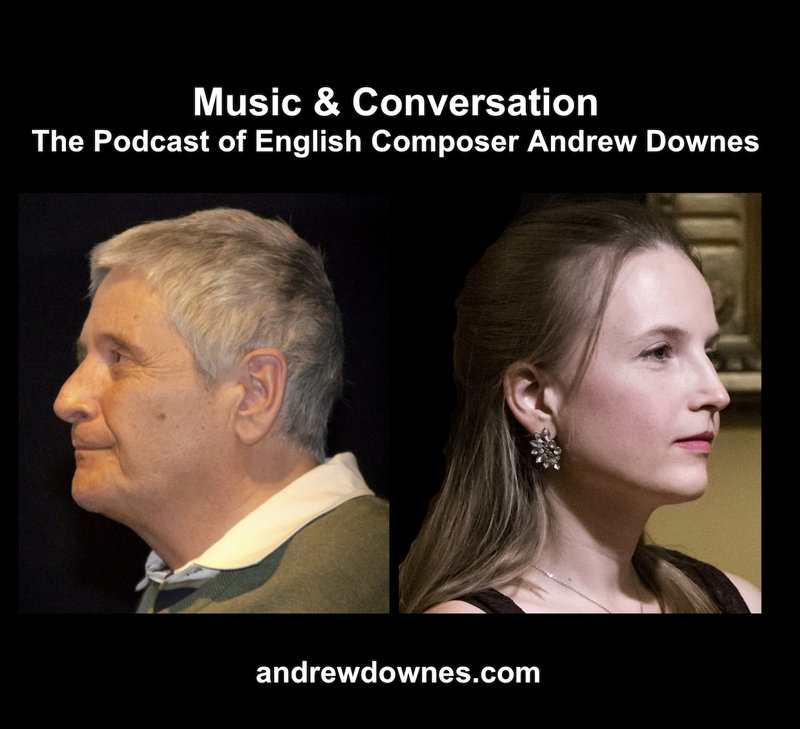 Here are 2 snippets from Peter's CD recording, with pianist Jane Hammond, of Andrew's Sonata (CD entitled Sonorous Sonatas) showing what the wonderful collaboration between a great composer and a great player with a superb accompanist can produce. 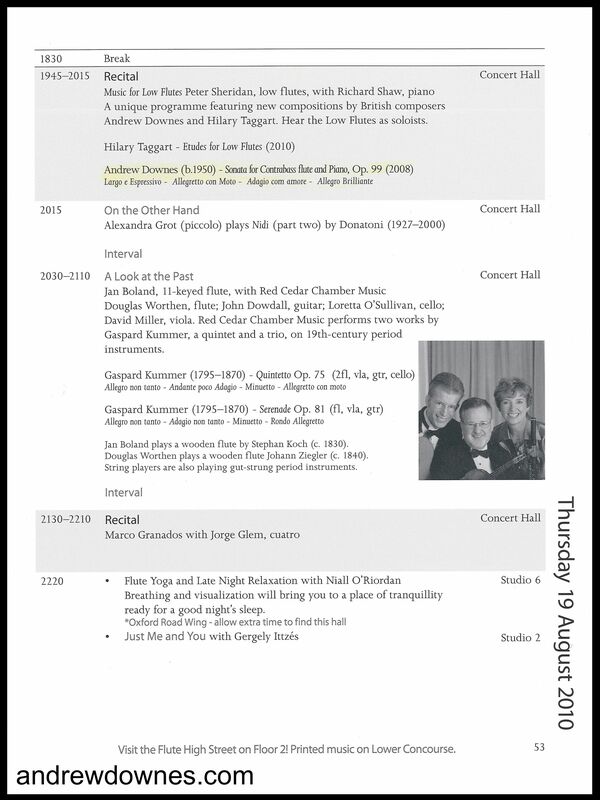 Peter premiered the work, with pianist, Claire Cooper, at Monash University, Melbourne, Australia, on 22nd April 2009. 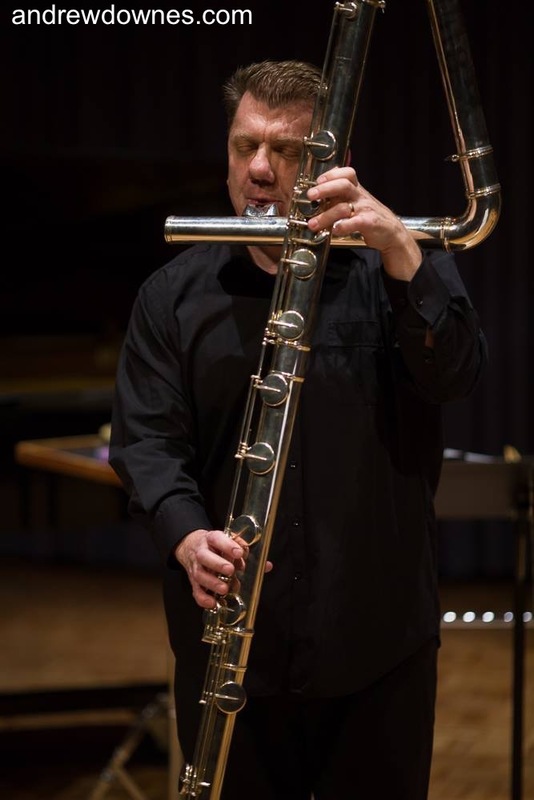 Peter Sheridan has performed the Contrabass Flute Sonata all around the world since. 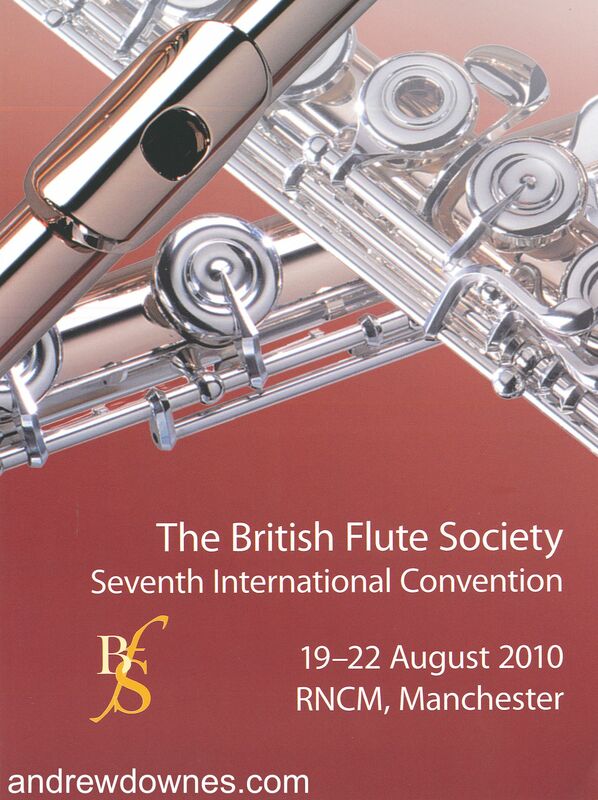 He gave the UK premiere, with accompanist Richard Shaw, at the Royal Northern College of Music on August 19th 2010. Andrew had just come out of Stoke Mandeville hospital at this time. 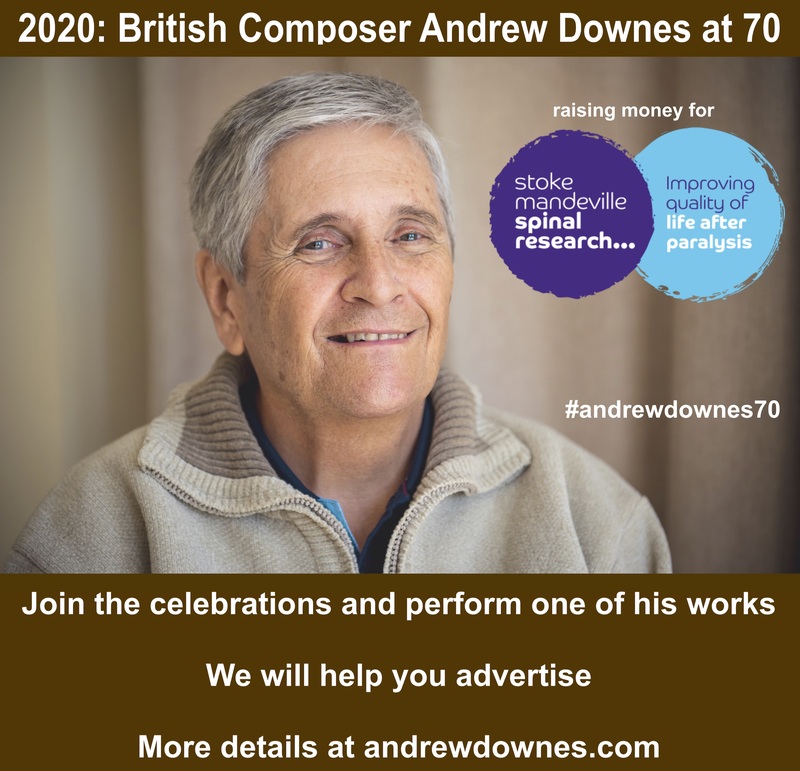 He broke his back in October 2009 and spent 9 months in the Spinal Injuries Unit at Stoke Mandeville. It took a while for us to build up the courage to venture out much when once Andrew was home, but we definitely wanted to attend Peter's performance. We booked into a hotel with disabled facilities close to RNCM, and allowed ourselves 3 hours to get to the concert from the hotel (!) But we didn't know about the one way system in Manchester. We could see the college, but all the streets were 'no entries'. It took us until 7.20pm to get there at last. Then we had to negotiate the underground car park. Andrew was still using a big heavy wheelchair provided by the NHS. I had to quickly get it out of the boot, unfold it, get Andrew into it and then push him up the steep hill out of the car park to the college. We arrived at 7.28pm, in the nick of time for the concert. We were very glad not to have missed Peter's wonderful playing. The return to our hotel took 10 minutes, because the hill to the car park and the one way system were in our favour! Thanks to compensation from Russell's Hall hospital, whose clinical negligence caused Andrew's paralysis, we now have a wheelchair accessible vehicle. The back door and ramp open automatically and Andrew owns his own Swiss made wheelchair with "emotion" wheels. We now use Sat Nav too! Have you performed in any of these works or come to watch? We would love to hear about your experience. Please share it here!